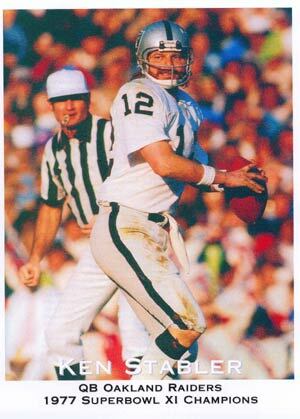 Former National Football League stars Ken Stabler and Billy Kilmer will sign autographs and meet with fans in Okinawa at the Camp Foster and Kadena AB commissaries on Friday, February 7th. They will at Camp Foster from 12:00 to 1:30 pm, and at the Kadena AB from 4:00 to 6:00 pm. Ken Stabler is best known for his days as the quarterback for the Oakland Raiders. He played his college football at the University of Alabama, where he played for the legendary Paul “Bear” Bryant. He was a member of the Crimson Tide’s National Championship team in 1965, and quarterbacked them to an undefeated season in 1966. He was voted the “Quarterback of the Century” at the University of Alabama. He played the majority of his pro career with the Oakland Raiders (1968 to 1979). Stabler was the NFL player of the year in 1976, played in five Pro Bowls (1973 to 1977), and led the Oakland Raiders to their first World Championship in 1977 in Super Bowl XI when they beat the Minnesota Vikings 33 - 7. Stabler retired from pro football in 1984 after playing with the Houston Oilers and the New Orleans Saints, and he was inducted into the Bay Area Sports Hall of Fame in 2000. Billy Kilmer is a graduate of UCLA, and played his early years with the San Francisco 49ers, where he mostly played running back. While in San Francisco, Kilmer took part in one of the most memorable plays in NFL history, when his fumble in a 1964 game against the Minnesota Vikings was picked up by Jim Marshall and run 66 yards the wrong way for a safety. In 1967, the New Orleans Saints picked him up where he played for four years before the Washington Redskins traded for him in 1972. Kilmer had his best years in Washington, where he led the Redskins to their first Super Bowl appearance in 1972, where they lost to the Miami Dolphins 14-7. Kilmer appeared in the Pro Bowl following the 1972 season, and played six more seasons with the Redskins before retiring from pro football following the 1978 season. In August 2000, Billy Kilmer was inducted into the College Football Hall of Fame for his playing days at UCLA. Mr. Stabler and Mr. Kilmer will make stops at eight commissaries throughout the Pacific If you miss them at your commissary you can check out their complete schedule of appearances at www.calsunshine.com. California Sunshine is sponsoring this NFL football greats tour to thank the men and women of the United States Military who are stationed in the Pacific for their dedicated service to their country.